On Saturday night, KEEN (Kids Enjoy Exercise Now) Greater DC awarded Bullis its Distinguished Community Impact Award at its annual gala, KEENfest. Dr. Boarman accepted the award and was surprised with a painting. Bullis students and the KEEN athletes also attended and performed because the theme was KEEN's got talent. One highlight was the fashion show, supported by A Beautiful Closet, a Bullis-parent-owned boutique. Another highlight was this video, produced by Bullis student Mark Williams '20. Bullis has partnered with KEEN since the KEEN Club at Bullis was founded about four years ago. Now, every other Sunday, KEEN athletes meet up with the same Bullis student to enjoy energetic activities from sports to zumba. One highlight of the Bullis and KEEN calendars is the Bullis prom, featured in Mark's video. 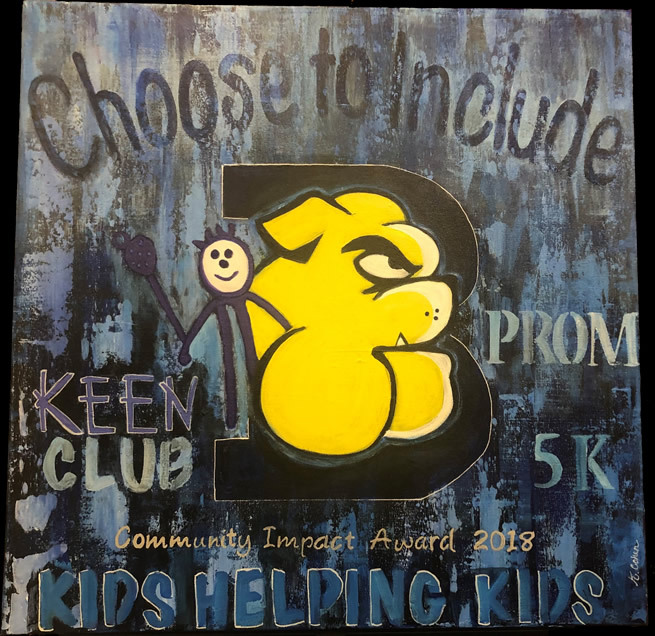 The KEEN Prom at Bullis began when a Bullis student from the class of 2016, and founder of our KEEN Club made a poster and brought a flower to meet her buddy at the adult gala, KEENFest. They had a wonderful night dancing and laughing. Bullis students decided they could do more. So the KEEN Club at Bullis planned a real prom. This year we'll host our fourth. With tuxes and dresses and a DJ and lights, they get decked out. And when the athletes arrive, they'll be greeted by their buddy/date. This is a great moment. "I liked it better than my own prom," said Ethan Copeland, a co-chair of this year's KEEN program and prom at Bullis.